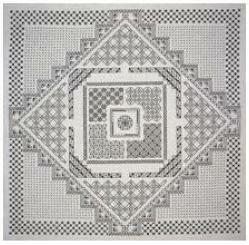 Traditionally blackwork samplers were stitched to learn and show off new stitches and patterns. You can do the same thing today with these delightful blackwork embroidery patterns. 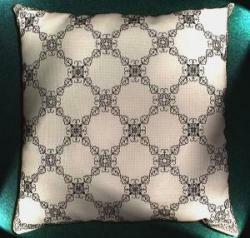 If you haven't done blackwork before check out my Blackwork for Beginners ebook. Two greens and a gold metallic thread are used to create this interpretation of a knot garden. 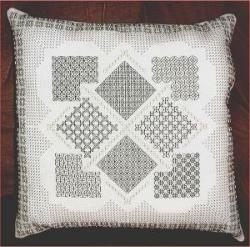 This blackwork sampler looks good framed or made into a cushion. Sheila from Tyne and Wear, UK, shared a photo of her Garden Sampler "work in progress", where she used Carrie's Creations "Rusty Nails" thread. 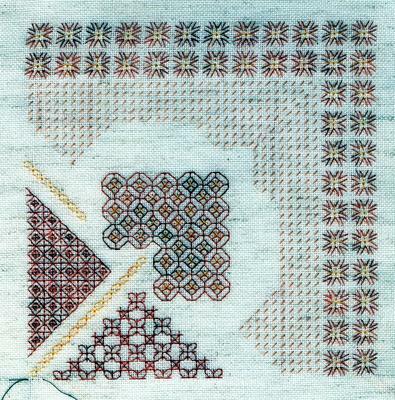 A partner design to the blackwork sampler above, the maze sampler is worked in black and gold. A pretty repeating pattern of oak leaves is used on this cushion design. You can stitch this mini blackwork sampler and make it up into a pincushion or choose to stitch just one square as a doll house cushion (i.e. 1/12th scale). 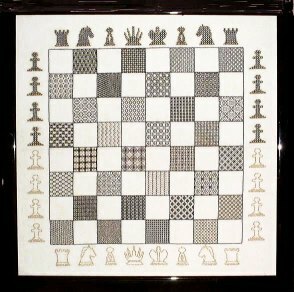 16 different patterns using black and gold metallic threads make up the centre of this blackwork chess board pattern. Surrounded by the chessmen themselves this design is a winner for any chess player. 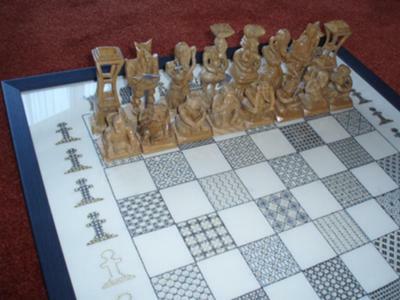 Kim Hudson, of Birmingham, UK, sent in this photo of her completed chess board, and tells the story of how it came to be, below. 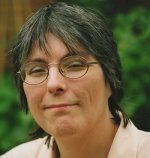 "A few years ago I was waiting in a very long queue to visit the first Outdoor Show at the NEC in Birmingham. We had been delayed entering due to set-up problems, so I dragged my (then) boyfriend to the Hobby and Craft show to kill some time just for a mooch. My Dad had carved me a chess set - which I have displayed in a cabinet, but I hadn't found a chess board that it fit so when I walked into the hall with all the beautiful cross stitch displays I was immediately drawn to the X-Calibre stand with a wonderful black and gold blackwork chess board on display. I was (still am) a bit of a novice and had only previously completed two cross stitch works of art - both dream catchers which still adorn my bedroom walls, so I was a little concerned about how much more complicated blackwork would be. I needn't have worried. Carol was so enthusiastic and helped me choose the size of Aida to make sure the chess set would fit. Stretched across my frame it became more of an item of furniture in my front room as I slowly completed it. Boyfriends came and went - Dad had a cardiac arrest but thankfully survived it - and he was recently well chuffed when he saw the finished framed masterpiece. I personalized one square with the family names and am now waiting to play my first game of chess with Dad, using the board. 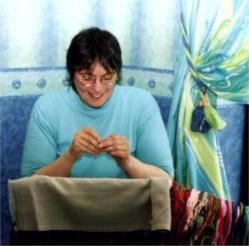 Hope you like the picture and thank you Carol."